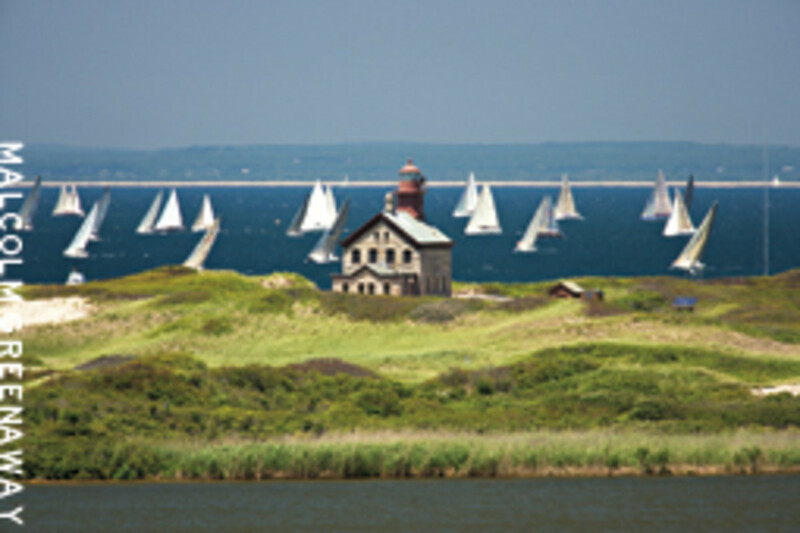 Block Island holds a special place in the hearts of boaters. 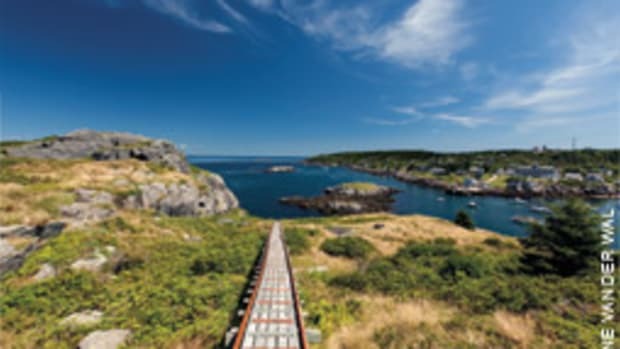 You have to complete a 12-mile passage to get there, then pick your way into Old Harbor or maybe battle a headwind through New Harbor’s channel. And the landfall is delicious, whether it’s your first or 100th trip across Block Island Sound — or in my case after 72 days of sailing direct from Cape Town, South Africa. When I came up on deck early that June morning, Mohegan Bluffs and Southeast Light loomed close, not the empty seas that had surrounded us. The memory still gives me goose bumps after 30-plus years. Watching the lighthouse grow larger as the steady breeze carried Scud toward Great Salt Pond’s entrance, conflicting emotions battled — exultation over our successful circumnavigation begun here five years earlier; sadness for the end of our self-sufficient sea routine; eagerness to smell, touch and walk on stable ground; and curiosity about what I’d find on shore. Block Island never disappoints me. Not on that trip, nor others before or since. Its rolling green hills, 17 miles of pristine beaches and the time-warp feeling are constants. The island as a place dominates, even as the summer population swells to 12,000, when 130-plus boats and their crews crowd the marinas during Block Island Race Week, when thousands descend on this “Bermuda of the North” for Independence Day and Labor Day celebrations. Discovered by Giovanni da Verrazzano in 1524, charted by Dutchman Adrian Block in 1614 and settled by Englishmen soon after, this 3-by-7-mile pork-chop-shaped, beach-rimmed glacial detritus has no natural harbors. Residents built Old Harbor’s breakwaters in 1870 and opened Great Salt Pond to the ocean in 1895, creating New Harbor. Like me, visiting boaters prefer New Harbor with its 45-acre anchorage and 400-plus moorings. 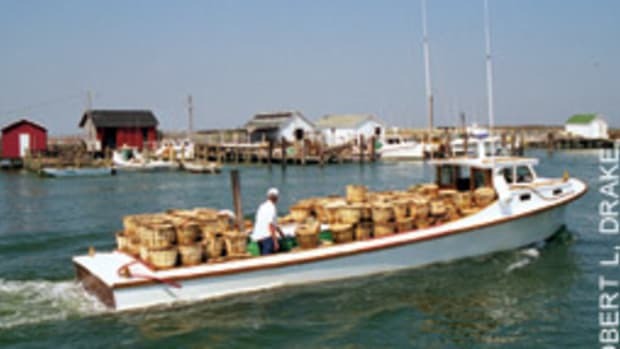 The 90 moorings owned by the town of New Shoreham (Block Island’s municipality) are first-come, first-served. 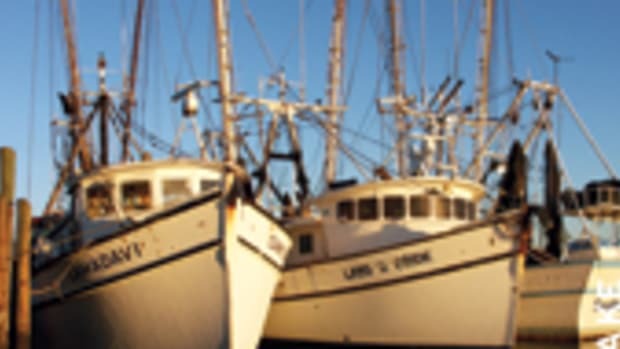 The harbormaster (VHF channel 12) rents private moorings after 3 p.m. 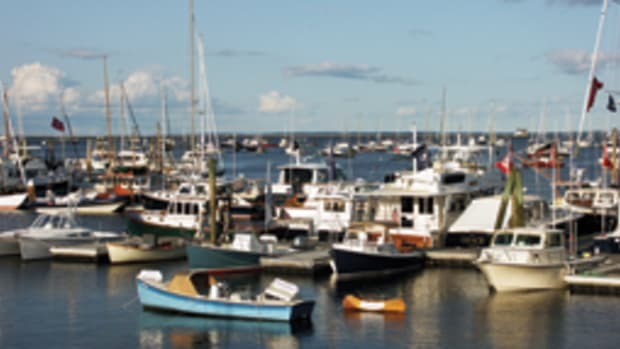 The three private marinas — Champlin’s Resort and Marina, Block Island Boat Basin and Payne’s Dock — also rent slips. 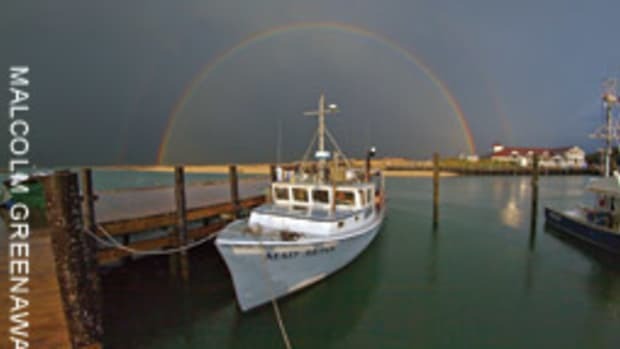 Block Island Boat Basin’s facilities also include the harbormaster’s office, launch service, dinghy dock and general store. For many, the first shore stop is The Oar for a mudslide. Some bring their own oar, emblazoned with their boat’s name, to add to the thousand-plus that embellish the walls and ceiling. “It’s worth buying a drink there just to see the gazillions of oars,” says Mattapoisett, Mass., sailor Jack Mallett. Some boaters get no farther than Champlin’s, where more than 200 boats can raft at the protected docks. 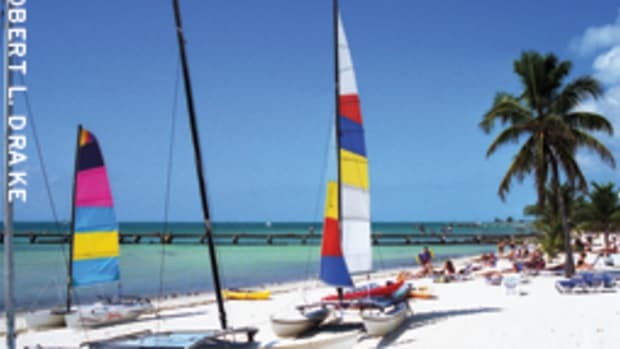 In addition to fuel, dinghy dockage, launch service and other amenities, Champlin’s offers a swimming pool, movie theater, restaurant and bars, music, shopping, lodgings, family activities and bicycle, moped and boat rentals. A hearty “Andiamoooo!” resounds through New Harbor when the Leone brothers cruise the anchorage twice daily peddling Aldo’s Bakery’s pastries, coffee, fruits and light fare. Their father, Aldo, began the tradition 42 years ago, although he announced his approach by singing opera favorites. “Hearing Aldo’s arias echoing through the morning stillness is unforgettable,” Mallett recalls. It’s a 15-minute walk from New Harbor to Old Harbor or the beaches — some with lifeguards, concessions and facilities, others just pristine sand. You’ll pass venerable wooden hotels and Victorian homes that have welcomed vacationers for almost 150 years. Downtown, transient dockage is available at Ballard’s Marina and Old Harbor Town Dock (VHF channel 12), which flank the docks of mainland ferries. All of Rhode Island is a no-discharge zone, and Both Old Harbor and New Harbor are served by free pumpout boats. Block Island was never overdeveloped or “urban-renewed,” so Old Harbor’s National Historic District retains its Victorian charm. The vintage harborfront hotels house restaurants, specialty shops, business services and lodgings. The liquor store and farmers market are nearby. Island dining includes snacks, gourmet cuisine and pubs that rock into the night. Dining or drinks on the 1888 National Hotel’s porch overlooking Old Harbor is almost obligatory. So is having a Ballard’s Inn waitress serve cocktails to you on the beach. 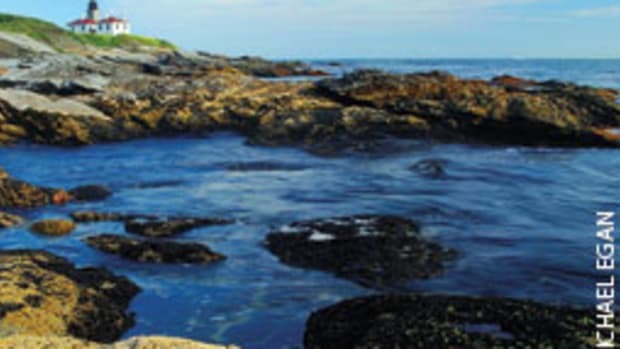 Get away from the action to experience why The Nature Conservancy considers Block Island a “Last Great Place.” Locals have conserved 43 percent of the island, protecting native, migrating and endangered wildlife. Bicycle along winding island roads, then walk some of the 25-plus miles of Greenway Trails threading Rodman Hollow, Clay Head and other preserves. 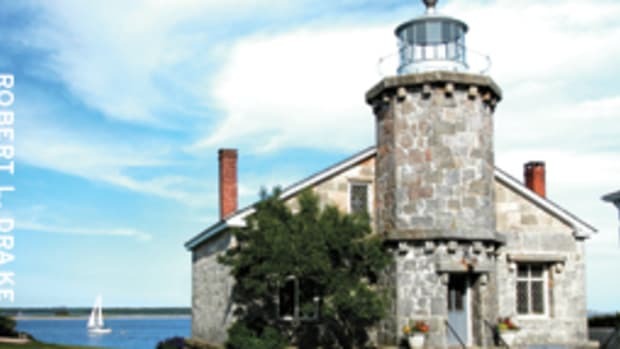 The view is worth a trip to the 1868 North Light, the fourth one built on Sandy Point. The first lighthouse, built in 1829, and two later ones succumbed to erosion. I always visit Southeast Light on 185-foot-high Mohegan Bluffs to tour the 1875 brick keeper’s duplex and attached light tower. Up there I can almost visualize Scud sailing home. DestinationsPrint magazine August 2012Block Island R.I.